Your alumni chapters have all won the full $1000 grant from AmeriCorps Alums to celebrate AmeriCorps during May 8th through May 15th, otherwise know as National AmeriCorps Week! Lets give them a round of applause ! AmeriCorps Alums is proud to be a part of great chapters like these that are continuing to get things done for America. 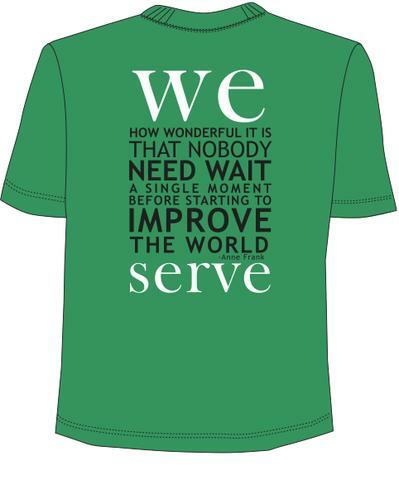 Those that applied but were not chosen as grant recipients will, like the winners, receive several of the National AmeriCorps Week special edition t-shirts. These shirts were designed in-house here at AmeriCorps Alums by our very own Jenna Rosengren! If you missed the deadline for the grant applications and still want to be a part of this exciting week please visit the official AmeriCorps Week event registration/sign up site here: www.americorpsweekevents.org. There you can find ways to get involved locally to better your community. And, while you are celebrating National AmeriCorps week don’t forget to get a special edition t-shirt of your own from our AmeriCorps Alums Store. Check out the green version below.